Pearling, testimony of an island economy, is a group of historic sites related to the harvest and trade of natural pearls. It centers around the island city of Muharraq, the main pearl trading city in the Gulf and prominent in the world until the introduction of cultured pearls by Japan in the 1930s. A pearl industry already existed here in Roman times. I loved it! The Shaikh Isa Bin Ali House is the single most impressive sight that I have encountered in Bahrain. As I was a bit underwhelmed by the other "attractions" of the island (the forts, the tumuli), this is a kind of site that I really like. 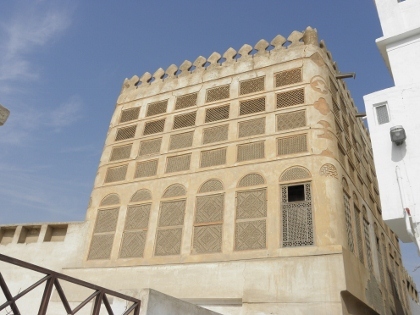 It is centered on a few streets in South Muharraq. 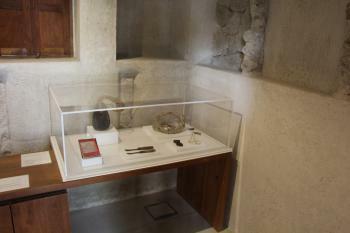 Here you'll find glimpses of another era, when the Bahraini lived from the pearl trade, and before all that came with the oil. The narrow streets have a slight resemblance to Zanzibar. 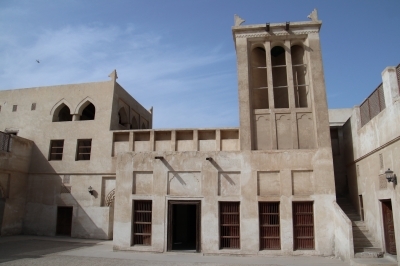 I started with a visit to the Shaikh Isa Bin Ali House - this was used as the seat of government in the late 19th century (Muharraq was Bahrain's capital at that time) and the residence of the ruler. It is a complex consisting of 4 separate quarters, almost a labyrinth to walk in. The decoration of the doors and windows is wonderfully done. The house also has the best example of a Wind Tower, a local implementation of early airconditioning. Closeby are the Siyadi House and adjacent mosque. The house unfortunately is closed to visitors - I wonder if it will open again after the area has become a WHS. It does look stunning enough from the outside though. 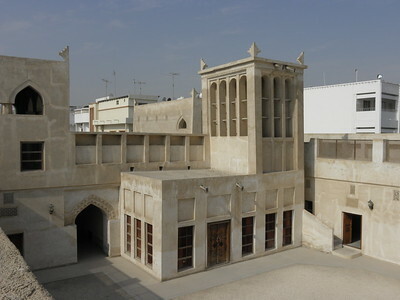 I read in the National Museum that they plan to connect 16 or 17 historic buildings in Muharraq with the dhow harbour in a 3km long heritage trail. When I visited I did not find any clear evidence that this has been implemented yet. And there's not much activity left in the dhow harbour. Just to confirm the previous guesses, the heritage trail is still not really happening, so for anyone wishing to visit some or most of the locations, just mark them in your maps in advance. Having said that, the Sheikh Isa Bin Ali House is easy to find. Bahrain overall is best enjoyed with a rental car and there's a parking lot directly behind the property. The present opening hours are rather wonky: 8 a.m. to 2 p.m. on Saturday through Tuesday, 9 a.m. to 6 p.m. on Wednesday and Thursday and closed on Friday so plan your visit accordingly. 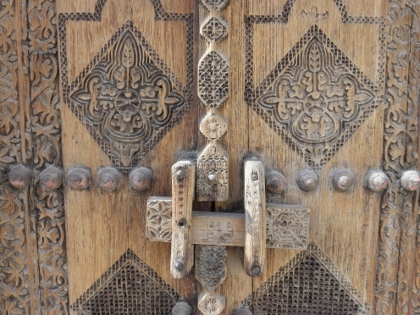 The house is a delightful site to visit: it is extensive and even though there isn't any furniture or decoration that remains, I particularly enjoyed the plaster embellishments of walls and gorgeous carved doors - though the best example can be found in the Bahrain National Museum. It has become a popular site with tourists nowadays so prepare not to have it to yourself. Much to my surprise, I really had a good time in Bahrain, explored its interesting Dilmun archaeological sites, futuristic modern architecture and one of my favorites the beautiful heritage pearl merchant houses with lively souk on Muharraq Island. 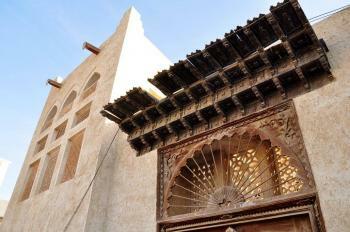 Similar to Els, I really impressed with the beautiful Sheikh Isa Bin Ali House. This heritage house was once the palace of Bahraini rulers and is indeed one of the best sights I saw in countries along the Persian Gulf, I even called it the little Alhambra of Bahrain. Unfortunately that this impressive complex is not a part of the World Heritage Site, the Pearling trail. Since my guide already told me that the Bahraini Government’s project on Pealing trail has been scrapped due to lack of interest and budget! He was quite surprised when I told him that I wanted to see the trail as he rarely heard tourists mentioned this, seem to me that the World Heritage Site inscription on Pearling trail did not increase any attention on this heritage. After discussion with my guide, he eagerly recommended me to see only one site that is part of the nomination, the Siyadi Complex, but at the end I unexpectedly managed to see Amarat Ali Rashed & Yousif Abdurrahman Fakhro (group of three storehouses) and Siyadi Shops while I was visiting Muharraq Souk. The Siyadi Complex of three buildings, the house, the guesthouse and the mosque, are really beautiful at least for its exterior as the whole complex are closed for renovation. My guide told me that there is nothing change for at least four years now and no one know when the complex will be open to the public as museum of pearl which the government once told UNESCO. The highlight of the complex is the guesthouse that really impressive for its elaborate façade. After my guide learnt that I am an aficionado of Halwa, something I got from my Oman trip, he determined to take me to Muharraq Souk to sample the famous Bahraini Halwa, which is the jelly version of this Middle East dessert. He claimed that Muharraq Island is the best place to buy authentic Bahraini Halwa and judging from car licenses from almost every countries in the Gulf Region in front of the shop, the shop that my guide took me is really famous. While in the souk he took me to see very old coffee shop famous for its coffee with cardamom that even Saudi Prince has to come for a sip. Unknown to me at that moment the coffee shop is located in Amarat Ali Rashed & Yousif Abdurrahman Fakhro (group of three storehouses), a dilapidated historic shop houses that prompt to crumble anytime, and some part already destroyed by fire few years ago. I also walked pass the Siyadi Shops unknowingly. I did not considered the Pearling trail is a fine World Heritage Site as the sight I saw only the guesthouse of Siyadi complex is worth to visit, but combine with other elements of Muharraq Island that full with historical houses, maze liked street and lively souk, the visit to Pearling trail is really enjoyable and become the most memorable part of my Bahrain trip, and in my opinion the Pearling trail together with Sheikh Isa Bin Ali House and Muharraq Souk is much better than historic precincts of Khor Dubai or Doha for its authentic atmosphere of Middle East. Unlike Els I did not particularly like this site. I stupidly tried to see as many of the enlisted properties as possible. Don’t. I suggest you drive straight to the Isa Bin Ali House (my Sygic app knew the place) and visit that one. From there you can reach the still closed Siyadi house in about 2 minutes by foot and shoot some pictures from the outside and end your visit. I spent around 1.5 hours chasing the other places. I found 2 larger places that are under heavy renovation and not even worth a picture, 1 tiny sign that said Pearling Pathway ant pointed to nowhere and the only other open “house”, a ruin in the south with a few expositions inside. This WHS might become interesting in a few years, when all reconstruction is finished. We visited most of Bahrain's T List sites in 2005 and, with Bahrain hosting the 2011 WHC, are interested to guess which (if any) might be inscribed as that country's "reward"! Could it be the "Pearling and its Cultural Landscapes in Bahrain" site? This site was only added to Bahrain's T List in May 2008. We didn't go out to see the Oyster Beds which consitute 3 of the 4 proposed areas but the remaining part of the site consists of "The coastal cultural landscape of "Bu Maher" (which) comprises dhow cleaning, maintenance and landing facilities." And "groups of historic buildings and locations, located parallel to the historic coastline, which represent the core places of the social, cultural and economic system of pearling". The island of Muharraq, where all these are situated, is the hub of Bahrain's sightseeing area and, in common with most other visitors, we visited the Dhow harbour etc (photo) and the traditional buildings behind it. It is certainly an interesting, pleasant and relaxing area - but of WHS "quality"? I personally would have doubted it, BUT Bahrain appears to be embarked on a successful long term strategy both to preserve its historic remains and also to develop its regional tourism credentials. Building the wonderful National Museum was a key plank in the strategy. 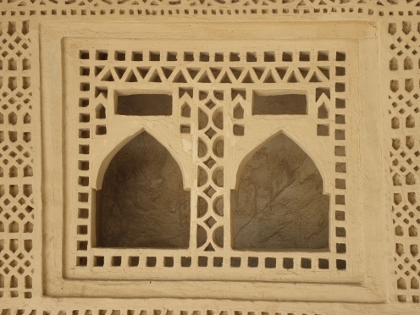 Restoration of the Qal'at Al Bahrain commenced in the early 1980s and eventually yielded the country's first inscription in 2005. Now Bahrain is going to host the 2011 WHC and has got itself made "World Heritage Regional Centre for Arab countries". This is a country which is well focussed on playing the UNESCO game. So I wasn't surprised to find this "link" which indicates that the Pearling area on Muharraq is due for a major development leading to consideration for WH status in 2010 - nicely in advance of that 2011 WHC!! I certainly wouldn't bet against Bahrain achieving this objective and it being the prize with which to burnish that WHC in 2011! But let's also hope they don't turn the area into too much of a "shopping oportunity"! Festivals: In earlier days the beach which connected the oyster beds to the main land was used as a location for special festivals in which the women folk of the pearling community and their children celebrated as the dhows left and returned to the shore. ... The grand festivals were called Rakbah on the day they left to sea and Quffal on the day they returned.